Wedding planner Karina Lyn Lopez had this sign created for one of her couples. 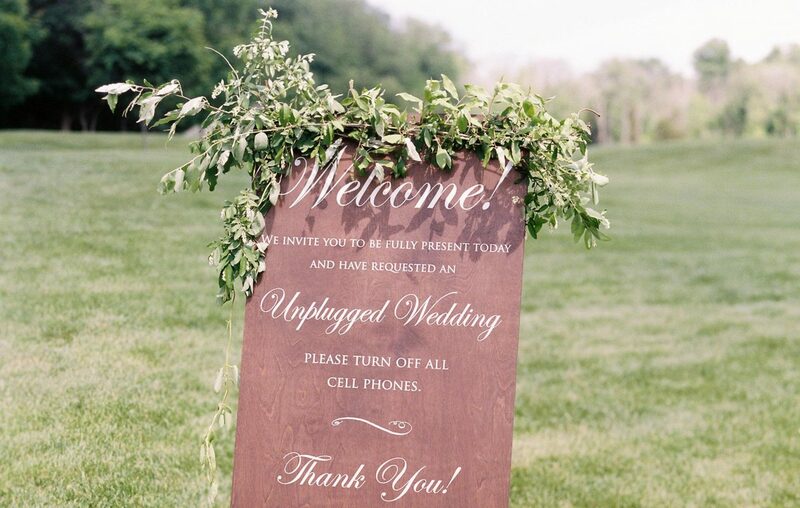 Should cell phones be allowed at my wedding ceremony? Let me first go back in time with a personal reflection. Some of my favorite wedding photos were waiting for me in my mailbox—a literal, real, next-to-the-curb one—when I arrived home from my honeymoon. The year was 2000. They were glossy prints from my friend Meredith, who had photographed us exchanging vows and walking back down the aisle in a set of lovely, candid shots. This, of course, was a few years before every single human had a good-quality camera in their back pocket 24/7, and before social media documented everything in real time. I loved the photos because they were a first look at my wedding, and because photos at that time were less common and took some effort to take, process and mail. They arrived in a pretty little stamped envelope, in which they are still housed in a box among other wedding photos. Today, of course, you can relive your entire ceremony on the limo ride to the reception. We all know what it’s like when we’re snapping shots or taking video of a special moment: We end up missing it entirely. Being a slave to our phones erases mindfulness, creates an emotional distance and prevents us from truly experiencing an event as it unfolds. Couples are realizing they’d rather have their guests fully present than see a few more angles of their wedding officiant on Instagram. It ruins the other photos. You know, the artful ones that you’ve hired a professional photographer to capture. This person has been hired for a reason: She knows the shots to get, she knows the angles, she knows how to discreetly insert herself into a situation. Ceremony shots where every single guest is holding a phone over his/her head, blocking the photographer’s sight lines (and ruining your compositions) end up being a bummer. It’s also worth examining why people feel so strongly about taking photos of your ceremony. Is it really for the couple, or is it about the person taking the photo? If it’s the former, they should be happy leaving it to the pros. Of course, no one likes draconian mandates, especially during life’s lighter moments, and some guests may panic at the idea of turning off their phones for an hour. But I maintain that best practice 2018-19 is to politely let guests know that the ceremony is a no cell-phone zone. You can even get pretty with it, like this sign wedding planner Karina Lyn Lopez of KC You There did for her clients at a recent wedding. Plus, that special moment, after days of anticipation, when you can see your official ceremony photos for the first time? Priceless. Need some real advice for modern times? Send your wedding-related conundrums to dossher@buffnews.com.